A Texas family with Nebraska roots is joining forces with an innovative Husker program to ensure more of Nebraska’s most talented students succeed in college. “Our desire is to help kids who are bright and want to go to college but can’t afford to,” said Bob Trenchard, an El Paso-based attorney. Trenchard and his current wife, Norma, said they have been impressed by the academy’s comprehensive approach of starting in high school to teach outstanding first-generation and low-income students the skills they will need to thrive in college and beyond. The gift marks the start of a long-term relationship between the academy and the Trenchard family. The Trenchards have pledged significant bequests from their estates to the University of Nebraska Foundation and also plan to donate the assets of their foundation. Officials familiar with the planned gifts say they amount to the largest donation to the Nebraska College Preparatory Academy since the university established the program in 2006. Omaha’s Sherwood Foundation gave $2.5 million last year that expanded the academy to serve four high schools, from the previous two. “This gift is unique because it’s not just about the scholarships, it’s about the relationships we will have and will hope to gain with the Trenchard family,” said academy founder Amber Williams, assistant vice chancellor for academic services and enrollment management. Currently 99 academy graduates attend the university. Last year’s expansion could double that number. 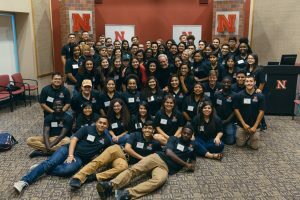 All 30 scholars who successfully completed the high school program in 2017 started college this fall, 28 of them at Nebraska. The Trenchards’ support will help the academy fulfill its financial promise to students who complete the rigorous high school program. Scholars receive assistance to cover the cost of college, including tuition, books, room and board, and fees. Bob Trenchard, who grew up in Holdrege, Neb., earned a bachelor’s degree in philosophy from the University of Nebraska in 1969 and a law degree from the University of Texas in 1972. He established a successful practice representing Permian Basin oilfield workers in personal injury and wrongful death lawsuits. He was named a Texas “Super Lawyer” by “Texas Monthly” magazine in 2003, which reported he had probably handled more oilfield accident cases involving serious injury or death than any other lawyer at the time. The Trenchard Foundation was first established to fund scholarships after Barbara Trenchard’s death in 2004. In 2016, the name was changed to The Trenchard Foundation to memorialize Bob’s sons, Trey Trenchard, who died that year, and his brother, Todd Trenchard, who died in 2011. Since its inception, the family foundation has awarded 32 scholarships to outstanding students in the Permian Basin in need of college financial assistance. Bob’s wife, Norma, and daughter, Jill Trenchard, the foundation’s vice president, have been part of the family’s scholarship efforts. Norma Trenchard, a first-generation American who grew up in New Mexico, didn’t learn English until she was about seven years old. Trenchard said the recent deaths of his sons led him and his family to re-evaluate their legacy. Serving low-income students whose parents didn’t attend college, the academy originated at Grand Island Senior High School and was expanded to Omaha North Magnet High School in 2008. The Sherwood Foundation gift in 2016 enabled the program to expand to Omaha South Magnet High School and to offer additional opportunities for students in the Winnebago Academy, a similar college preparatory program run by Winnebago Public School. While cost is a major impediment to low-income students, money is not enough to assure success, Williams said. The academy provides academic, social, and college preparation through three pillars of excellence: knowledge, character, and commitment. Students in the program receive counseling and support, leadership building and personal development throughout high school and college. Students who go on to the university become part of the Institute of Excellence, which provides continuing support and guidance as scholars adapt to college life.